The famous Arecibo Observatory in Puerto Rico, which beamed out the original Arecibo Message on Nov. 16, 2016. More than four decades after humanity's first real attempt to reach out to intelligent aliens, a new generation will craft an interstellar missive of its own. 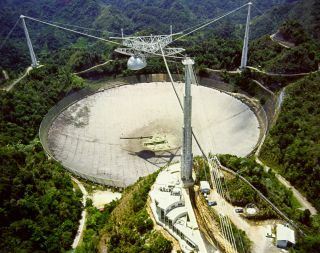 The Arecibo Observatory in Puerto Rico is asking young people around the world to devise an updated version of the famous "Arecibo Message," which a team of astronomers led by Frank Drake beamed toward the distant star cluster M13 on Nov. 16, 1974. "We are sure that the young minds around the planet will create a smart, creative and safe way to say hello to our possible galactic neighbors! Can't wait to receive the proposals!" Arecibo staff scientist Alessandra Abe Pacini told Space.com via email. "Our focus is really on the educational part of the activity, and our goal is [to] engage the youth in space affairs, promoting the unique capability of our AO," she added. The "New Arecibo Message" competition will proceed via a number of different steps, the first of which occurred on Nov. 16 with the launch of the contest website. The next big event will come on Dec. 16, when "Part 1" of the challenge is released. To learn more, go to http://www.areciboobservatory.org/challenge/about-challenge.html. The original Arecibo Message is still a long way from its target destination: M13 lies about 25,000 light-years from Earth. The Arecibo Message, and projects like it, remain a topic of considerable debate within the SETI community today. Some researchers deem it irresponsible and potentially dangerous to reach out to alien civilizations whose intentions and capabilities we know nothing about. The late cosmologist Stephen Hawking was perhaps the most prominent voice urging caution about METI (messaging extraterrestrial intelligence). He repeatedly warned that drawing attention to ourselves in this way could lead to the subjugation (or worse) of humanity by a colonizing force. On the other side are researchers who argue that aliens capable of coming here to destroy us almost certainly already know that we exist, thanks to the radio waves we've been passively sending out for a century or so. And trying to make contact could even convince our neighbors that we're worthy of talking to — interesting enough to merit inclusion in the "Galactic Club." Astronomer Doug Vakoch, the president of San Francisco-based nonprofit METI International, is in favor of reaching out. He has participated in other METI efforts recently, and he said the New Arecibo Message is a good idea for a variety of reasons. "One of the greatest challenges we face in designing interstellar messages is to keep open to new alternatives," Vakoch told Space.com via email. "It's easy to simply repeat the sort of messages we've already sent. By asking a new generation what they want to say to ET, and how they would say it, we could get innovative solutions to creating messages that aliens may even understand." But it's not clear at this point if the New Arecibo Message will follow its predecessor into space or remain strictly an education and public-outreach project. Space.com asked Abe Pacini if the new missive will ever be beamed out and, if so, where. She replied: "Only after evaluating the proposals, I'll be able to answer your question for sure."